Lancaster Table & Seating: How to Assemble a Wooden High Chair. Before starting, make sure you have all required pieces. First, attach the seat to one of the side panels with the included screws and peg to tighten the screws. Position the handle bar, or lap bar, slide the nylon crotch strap over the bar, and the attach the handle bar with screws. Position the backboard and attach. Next, attach the second leg, or panel, and tighten the top half with your peg. Next, attach your support bars along the front and back of the high chair. Tighten the bottom half, as well as both sides. Unassembled high chairs are a great way to save money on shipping! This video guides you step by step on how to assemble your high chair, so you can be sure that the children you serve are safe and comfortable. 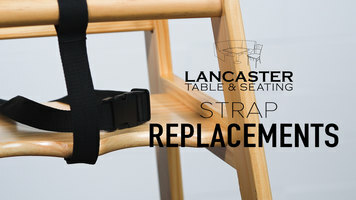 Learn how to replace both crotch straps and seatbelts on your Lancaster Table & Seating high chairs. 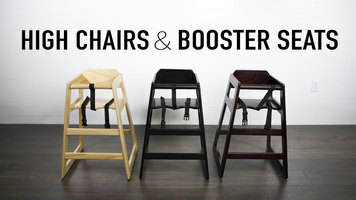 Welcoming families of all sizes is easier than ever with high chairs and booster seats from Lancaster Table & Seating. All seating options, whether solid wood or plastic are Consumer Product Safety Commission compliant to ensure guest safety and comfort. 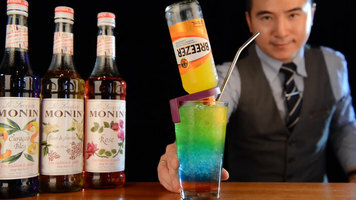 Wow your guests with this colorful rainbow jenga cocktail using various Monin syrups! Watch the video for a complete recipe.